I first made the original version of this cake WAY back in 2009. It was a recipe on the cover of Bon Appetit magazine as a Peppermint Chocolate Cake (the photo is embarrassing but the cake is still SO good!). It was perfect for a Christmas dessert. As I shared in that post, it was the start of a special relationship with Abby Dodge; a creative and talented baker, yes, but an even better friend. Funny, we’ve never met but we have talked on the phone, tweeted like crazy and I worked with Abby last year to renovate her website. Lately I’ve been an ardent participant in her #baketogether series. Inspired and led with a recipe from Abby, our group can modify, eliminate, add to or renovate as our heart desires from that starting point and through the month we all share our finished creations. It does build a connection and while not quite the same as being together in one kitchen, we are virtually together, supporting each other in our endeavors and building relationships over our mutual love of baking. I’ve wanted to do this cake again ever since that first effort but as something less Christmas specific. I admit, I might have asked begged Abby a bit to consider it for #baketogether because it’s just a fabulous dessert. It has several steps but nothing about it is hard; just give yourself two days and take your time; each individual step is easy. Abby and I talked back then about combining two of my favorite flavors, chocolate and hazelnut for a sophisticated version that could be served at any time of the year. What makes the finished result so special? Thin layers of a perfect chocolate sponge cake are layered with baked meringues; each layer of cake is soaked with Frangelico simple syrup and all layers are spread with a fabulous milk chocolate and Frangelico ganache. You can call it ganache Abby, I think I’ll just call it fudge! For this version I topped it with toasted hazelnuts. It was just the perfect finish for a lovely Christmas dinner of ham, macaroni and cheese, a squash casserole and my virgin experience with collard greens that I enjoyed on Christmas Day with friends. As I contemplated exactly how to pull it together, I couldn’t help but think of the lovely candy I typically only buy over the holidays, sometimes just tucking a couple into the gift baskets I make each holiday season, the fabulous Ferrero Rocher hazelnut and milk chocolate candy wrapped in gold foil. As if meant to be, I also had just recently purchased some beautiful gold sugar crystals from King Arthur Flour…large enough to really make an impact if added to cookies or a cake and I thought the glittery gold crystals would be ‘the icing on the cake’ for this dessert, making it also perfect for a New Years Eve party for some special friends. Although we enjoyed this dessert on Christmas day I can see this cake on any holiday table. It’s gorgeous, it tastes fabulous and it’s just perfect for a party. Or breakfast (oh yes I did!). Layers of sponge cake, liqueur, baked meringue and a chocolate ganache produce a beautiful and delicious cake. Mix all ingredients together in a food processor until it becomes a semi smooth paste and set aside. Lightly butter bottom and sides of 13x9x1-inch baking pan. Line bottom of pan with parchment paper. Lightly dust sides with flour. Sift 1/2 cup flour, cocoa powder, baking powder, and salt into medium bowl. Using electric mixer, beat eggs and egg yolks in another medium bowl until pale and foamy, about 2 minutes. Add sugar and vanilla; beat until mixture is thick and ribbon forms when beaters are lifted, about 3 minutes. Mix in hazelnut paste gently. Sift flour mixture over egg mixture and gently fold in with rubber spatula just until incorporated. Transfer batter to baking pan; spread evenly to edges. Bake until top springs back when gently touched and tester inserted into center comes out clean, about 15 minutes. Transfer baking pan to rack and cool cake 20 minutes. Run small knife around sides of cake to loosen. Invert cake onto parchment-lined work surface; gently peel off parchment. Cool completely. Using serrated knife, cut cake in half lengthwise, each half should be 12×4-inch rectangle; trim if necessary. Position rack in center of oven and preheat to 175°F. Using dark pen or pencil, trace two 12×4-inch rectangles on sheet of parchment paper; turn parchment over (rectangles will show through) and place on large rimmed baking sheet. Trace one 12×4-inch rectangle on second sheet of parchment paper; turn parchment over and place on second rimmed baking sheet. Sift powdered sugar, superfine sugar, and salt into medium bowl. Combine egg whites and cream of tartar in large bowl of heavy-duty stand mixer fitted with wire whisk; beat on medium-low speed until frothy. Increase speed to high; gradually add sugar mixture and beat until stiff and glossy peaks form, about 3 minutes. Beat in vanilla and Frangelico. Divide meringue equally among prepared rectangles on parchment (about 1 1/3 cups for each); spread meringue evenly within traced lines. Bake meringues until dry and crisp but not browned, about 3 hours. Turn off oven and let meringues cool completely in oven.Carefully remove meringue rectangles from parchment. Simmer cream, butter, and corn syrup in medium saucepan. Remove from heat. Add chocolate; whisk until smooth. Whisk in vanilla and salt. Let stand at room temperature until thick enough to spread, 1 hour to 1 1/2 hours. Add 1 Tbsp of Frangelico to sugar water to make Frangelico Glaze. Transfer 1/2 cup buttercream to pastry bag fitted with medium star tip; reserve for piping rosettes. Brush off any crumbs from meringue layers and cake layers. Place several small dabs of buttercream down center of 15-inch-long rectangular serving platter. Place 1 meringue layer, top side up, atop buttercream on platter, anchoring to platter. Using small offset spatula, spread 2/3 cup buttercream over meringue. Top with 1 cake layer, top side down, pressing gently to adhere. Brush cake layer with 1/3 cup of the Frangelico syrup (cake layer will be very moist). Spread 1/2 cup buttercream over the cake layer. Top with second meringue layer, top side up. Spread 1/2 cup buttercream over. Sprinkle 1/4 cup of toasted hazelnuts on top of buttercream. Cover with second cake layer, top side down. Brush with 1/3 cup Frangelico syrup and then spread layer with 1/2 cup buttercream. Top with third meringue layer, bottom flat side up. Spread thin layer of buttercream over top and sides of cake. Fill pastry bag fitted with medium star tip with remaining ganache. Pipe small rosettes around bottom and/or top of cake. Finish cake with remaining 1/4 cup of toasted hazelnuts and food glitter if desired. Chill cake at least 6 hours. I made the cake first and the meringues next so that I could put them in the oven and forget them. I turned the oven to 175 degrees and set the oven timer for 2 hours and 45 minutes and left the meringues in the oven overnight. Prep time includes time to assemble the cake. I’ve made this 4-5 times already and it’s such a hit. The only question I have is, I’ve never been able to get the cake and meringue leveled/even on the sides so that the frosting goes on smoothly. Do you have any tips? You could trim the pieces? I would make a template on a piece of parchment paper and use it as a guide to cut the edges evenly for both cake and meringue. The meringue is trickier because it can crack but I’ve used a bread knife with good results when I’ve needed to do that. One other thing might help too. Sometimes it’s advantage to do what is called a crumb coat. You put some frosting on all around the sides but just barely, enough to cover everything just slightly. Then refrigerate it to harden that light frosting. When you remove it from the fridge, it’s easier to frost with the remainder of the frosting as it won’t pull any crumbs into your knife strokes. That might be all you need? You’ve made this more than me! I need to do it again and take new photos…it really is a fantastic cake! That is glorious! I love meringue layers in a cake–surprising and fun! So do I Jenni; makes them super decadent yet still light; perfect in my book! Do you know Abby Dodge? This is my revision of her recipe I made before I knew her. Small world huh? if i want to make this cake in a round cake ? which size would be fine for all Ingredients you have pointed? That’s pretty hard to configure since it’s made in a large pan and then the pieces are cut to create the rectangle. I would just go with a smallish size like 8″ or 9″ round and then you’ll have to bake each unit individually. Make your pattern for meringues using the bottom diameter of your pan to create the circles. Let me know how it works out! It was FABULOUS! I love meringues in the first place but making them the crunchy part of this cake. Oh. My. GOODNESS! Hi from one St. Louisian to another…born and raised there but in Colorado now. I only decorated the cake with them; the flavors of the cake are chocolate and hazelnut but did not include any of the candy actually. this is a very lovely recipe, i want to bake this for my friend’s birthday! The fact tat you make the steps so simple it made a novice baker like me want to challenge this! However, i need advice abt the measurements of the ingredients for a 8 x 8 inches square pan. i would really appreciate your help! yeap, i am that inexperience. Sorry! i would like to know if i can order ferrero roche cake ? Sorry summer but I don’t make cakes for others; I simply post the results and recipes for others to try after I make something I love. kindly send me the reparation of Fer Roc chocolates with hazelnuts etc.Not the cakes but only Chocolates please !!! I am going to try and attempt to make this for my friends birthday..
You won’t regret it Samantha; it was to die for. My only bit of advice? Take your time. I stretch out the preparation so one day is not totally overwhelmed. At the very least make your meringues the day ahead…you won’t regret it, promise. Please do let me know how it goes for you…take a photo for me too? Of course I will let you know… along with a photo or two! I cannot wait… I am going to plan it all in advance, it does seem a challange for me but who wouldnt go through a challange to taste this at the end! Will make it next week 24th! This recipe is so conplicated but i thnk ican do it . Ithnk yu describe info good . Just give yourself two days and break it down Danielle; because none of the individual steps are really hard but you don’t want to push yourself timewise. Good luck; and please let me know if you do make it. I made the cake last week for NYE and it turned out amazing! Everyone loved it and I will be making it again for my mom’s bday tomorrow. I will post pictures soon. Thanks for this brilliant recipe! So happy it worked out so well for you. I love having readers have the same success I do and love a recipe. One thing that is great is that it really is capable of modifications; the first one I made was peppermint and dark chocolate (I can’t deny…I loved this better). Please do let me see some photos! Thanks Jen, I figure it would also make a fabulous cake for Valentines Day; maybe with a raspberry finish? Um, yes it would! Can’t believe I just found this recipe! It’s perfect! It seems a little complicated for my skills but I LOVE ferrero rochers and to have it in a cake that’s great! Daisy. If you break this cake down into step and give yourself 2-3 days to make it, I promise you…it is not hard at all. Or really complicated…it’s just a cake and some frosting with the addition of some meringue layers! If I can help…let me know. Thank you for the detailed recipe! I can’t wait to make this! Please make sure you come let me know when you do, OK? Would love to have you share it with me. Oh, my word! That is one heavenly cake. You make me chuckle because in a nutshell you hit the nail on the head! My favorite cake ever. This looks absolutely amazing! I’m planning on making this first thing in the morning for my NYE dinner. I was curious… The recipe for making the cake calls for 2 ounces of hazelnut paste. Are you referring to the hazelnut paste that is provided in the recipe? Or something like Nutella or a hazelnut spread? This is so beautiful! I used to be intimidated by dishes like this, but have learned it really is about breaking it down into manageable steps. Off to check out Abby’s site! You have hit the nail on the head Candy…nothing about any step is hard and though a long list of directions, nothing really takes all that long. I find it works better for me to do the meringues first and just leave them in the over overnight and do the cake the next day with assembly. The end result is so worth it. Heck, getting a photo was more difficult than any step of the production! Oh you must tell if you do…but mix it up even if you don’t have the candy. I’m thinking I have to do something caramelish next time. Not only is your cake beautiful but sounds totally decadent. A perfect way to end the year. Thank you for sharing the recipe. Oooo, I just promised myself no more baking but you’re tempting with this beauty! I know what you mean about people thinking twitter is nonsense but if I look at how many people I met (both virtually and in person) because of twitter then I just say; they do not know what they’re missing! Isn’t that true about Twitter…many of us have made valuable relationships so let the naysayers keep their heads in the sand because you are right…they don’t know what they are missing! The cake is…to coin a phrase…’the bomb’ – save it for an occasion; it won’t disappoint. Absolutely gorgeous – I love everything about this cake, and *definitely* need to try it! I’ll make it when you plan to visit Denver, I’ll promise you that but you could sure GF it by changing up the cake layers…if you ever do, you know I’ll be watching! This cake looks and sounds amazing! What a great idea……yum! What I love about the cake is how easy it is to modify the flavors for your own tastes. I’ve now done both a peppermint one and now a hazelnut one and they were both wonderful even if light years apart in flavor. OMG this looks good! I am going out for dinner on NYE but I am sure I could conjure up an excuse to make this soon! Do it Maris…so worth it! Have a wonderful and safe holiday. Thank you An…and the same to you; have a wonderful New Year. That’s one beautiful looking cake, Barb! Happy holidays and new year! Thank you Mike and the very same to you…have a great New Year! Wow, Barb, that cake is stunning. Simply stunning. Very decadent indeed, a real threat! Fantastic photos too! Thank you so much…the photo part is a constant work in progress; much harder for me than the baking! Thanks Alison…for the sweet compliment and the pin; it is a great cake to share! This looks absolutely divine! I can’t wait to try making it. and I LOVE your photos with the lights. fantastic! I want to ring in the New year with a slice of this! This is a show stopper. Thanks Sylvie and now heading over to check out your popcorn. Ever since buying a very cool stovetop popcorn popper and making GOOD popcorn, I’m having fun trying new recipes for the humble popcorn. wow !! stunning cake….looks extremely scrumptious 😀 have a great new years ! Thanks a bunch and the same to you…Happy New Years! I want to ring in New Years with this cake. 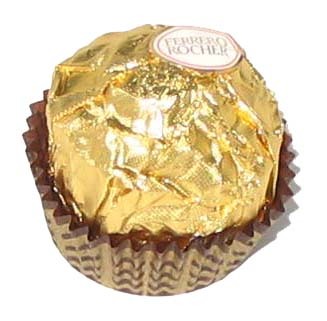 Seriously love ferrero rocher’s!! Then you would most definitely love this cake. Someone asked if it had to be milk chocolate. Well, of course not…but then it’s also not Ferrrero Rocher! What a beautiful spin, Barb! I hope you had the Merriest of Christmases, and a wonderful New Year. Cheers to a great 2012! Thanks Kim…it was something I’ve been thinking about for TWO years so have to admit some joy it turned out well. You are so sweet…my hope for you are the same and yes, Cheers to a great 2012! Thanks much Zee. As much as I love this cake, any kind comments on my photography are even more appreciated; it’s been a long process to move from being an experienced cook to taking photos worthy of publishing them. I have some doozies in the archives! Wow, Barb…what a showstopper of a cake! You’ve got some serious pastry skills, it’s just gorgeous! Oh, and Ferrero Rocher and more hazelnut and chocolate, plus dacquoise, buttercream etc. I think I’d die a happy woman after eating this. No, I know I would. I love making things like this and used to make cakes for everyone’s birthday…but now limit myself to just special occasions. This was one and it was perfect I think. Thank you Rebecca…and you too. To a wonderful 2012. Oh. My. Goodness!! This looks absolutely divine! What a fabulous job you did with the #baketogether project. I’m so impressed. I just want to dive right it. Yum! You make me swoon Barb! WOWSERS! I want to come to your party! This is absolutely STUNNING! I can see it would be a taste-and-die kind of cake. It is on my list. YUM! Love your enthusiasm…and it’s deserved by this one, I promise. Oh no…really? Chocolate? If you come up with your own version; be sure to let me know; can’t wait to see a spin you would put on it Chris. I love hazelnut. I’ll bet this cake is delicious. Awesome photo too. A definite pin! Thanks much Curt; I can not deny. It tastes as good if not better than it looks. Promise. Ok. That sounds like the perfect cake to me. I swoon over hazelnut chocolate. This cake is just spectacular and I love your photos! I am printing the recipe as I write this. I cannot wait to try this and I know it will work since it is a great collaborative effort between 2 great cooks/bakers. Happy New Year, Barb! Thanks Gwen…you have to keep me apprised of your plans too. Hope you try this one; is is so definitely perfect for a holiday. I love them too…and their brother Ferraro. 🙂 Thanks Pal and of course I would save some for you! Oh now, now, now! You really know how to ramp up a recipe! So delicious. Every component goes perfectly together. Except one. I’m not there to enjoy it! I thought it the only choice with hazelnuts but that’s probably because I had those gorgeous candies in mind; it was a ‘must do.’ I only wish we could share a slice; yours sounds divine too! I can tesitfy that this cake tastes as wonderful as it looks. My daughter and her friend polished off the last piece and my husband licked the plate out of desire for one last taste. I’m making mine today and I can only hope that it turns out as well as yours. Lovely photo. Nothing quite like a real testimony so thank you my friend and I knew I should have left more for you. You’re doing yours today? Hoorah!! Coming from you I take that as high praise indeed. I love to bake and love the effort of a grand dessert but don’t do them often as I need help eating them and with the kids gone I just know three meals a day of cake would probably not be best. Or would it? I too am glad we’ve become friends; I love the both of you and my wish is just like yours; that we all have a wonderful 2012! Beautiful and so tempting! A divine cake.